Article Composition: Ellen begins by creating a Usenet article, which is structured according to the special message format required by Usenet. This message is similar to an electronic mail message in that it has a header and a body. The body contains the actual message to be sent, while the header contains header lines that describe the message and control how it is delivered. For example, one important header line specifies which newsgroup(s) for which the article is intended. Article Posting and Local Storage: After completing her article, Ellen submits the article to Usenet, a process called posting. A client software program on Ellen's computer transmits Ellen's message to her local Usenet server. The message is stored in an appropriate file storage area on that server. It is now immediately available to all other users of that server who decide to read misc.rural. Article Propagation: At this point, Ellen's local server is the only one that has a copy of her message. The article must be sent to other sites, a process called distribution, or more commonly, propagation. Ellen's message would travel from her local Usenet server to other servers to which her server directly connects. It would then in turn propagate from those servers to others they connect to, and so on, until all Usenet servers that want it have a copy of the message. Article Access and Retrieval: Since Usenet articles are stored on central servers, in order to read them they must be accessed on the server. This is done using a Usenet newsreader program. For example, some other reader of misc.rural named Jane might access that group and find Ellen's message. If Jane was able to help Ellen she could reply to Ellen by posting an article of her own. This would then propagate back to Ellen's server, where she could read it and reply in turn. Of course, all other readers of misc.rural could jump in to the conversation at any time as well, which is what makes Usenet so useful for group communication. 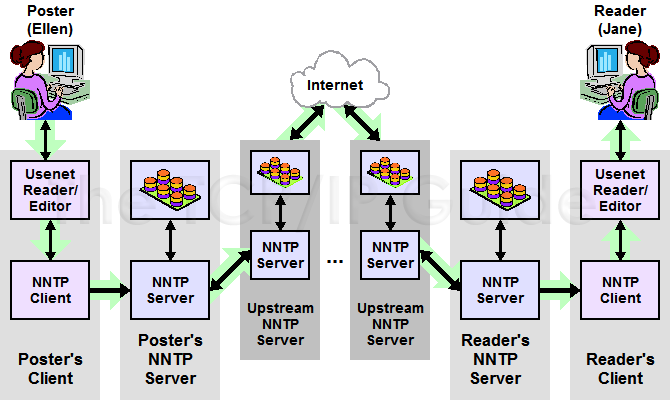 This figure illustrates the method by which messages are created, propagated and read using NNTP on modern Usenet; it is similar in some respects to the e-mail model diagram of Figure 301. In this example a message is created by the poster, Ellen, and read by a reader, Jane. The process begins with Ellen creating a message in an editor and posting it. Her NNTP client sends it to her local NNTP server. It is then propagated from that local server to adjacent servers, usually including its upstream server, which is used to send the message around the Internet. Other NNTP servers receive the message, including the one upstream from Janes local server. It passes the message to Janes local server, and Jane accesses and reads the message using an NNTP client.